To empower the best opportunity for a Prospective Student Athlete's collegiate future, volleyball families can build a pyramid of outreach to college coaches. When families build this pyramid, it allows them the opportunity to say "no"; saying "no" or "no thank you" is an important component of the recruiting process. 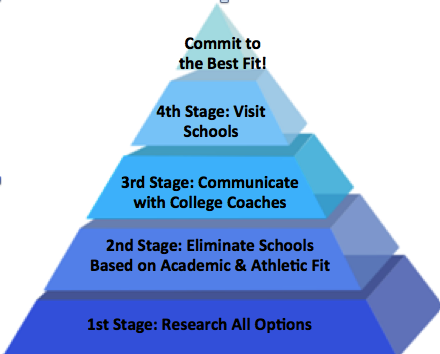 The outreach and evaluation process of potential collegiate programs should look like a pyramid. When beginning the outreach process, families need to be laying a wide base or the bottom of the pyramid. Be more open than closed to schools - Academic, Athletic and Geographic parameters should not be rigid. If you are considering schools within a 3 hour radius, open that circle up to 4 hours. If you are mainly looking at mid level NCAA Division I programs, reach out to elite level NCAA DII and NAIA programs. Should small schools be your comfort zone, throw a couple of medium sized schools into the mix. When families have a wide, stable base layer, it allows them to effectively review and eliminate those programs which may not be their best fit. When families have determined that a school is not their best fit (for whatever reason), then they can simply say "no thank you" and narrow their choices. Saying "no" is part of the review and management process. The college coaches understand "no" because they say "no" to many, many recruits who are not the best fit for their program. Recruits that have the most success in selecting their best fit for their collegiate future, are those which begin with a sizable number of potential schools and manage the process by saying "no" to achieve their volleyball and academic goals. Start with the 1st stage of the Recruiting Pyramid and and work your way through the process. If you need further assistance and education on the junior volleyball recruiting process click here. Also, for additional college volleyball recruiting information and support, please visit our Educational Partner, NCSA Athletic Recruiting.